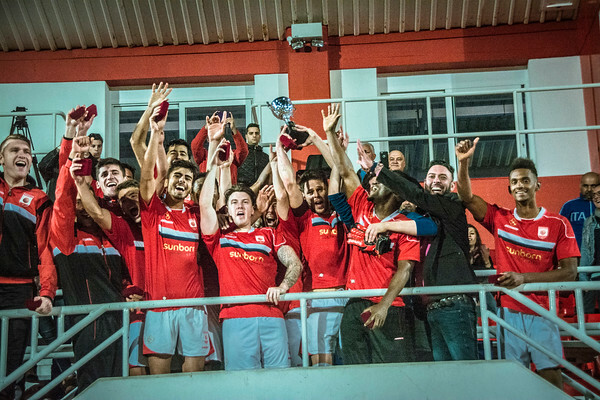 Europa Point came back from being 1-0 behind in the first half to take the match into extra time in Sunday’s Second Division Cup Final. A very competitive match saw Brunos Magpies dominate the initial score line but not the possession on the field. Both teams are sat at the top three of their division battling for promotion. Europa Point the most likely to get automatic promotion. The cup final was a place to prove themselves for both teams. Brunos brought with them their fan base which has become a talking point as they once again came in numbers. Extra time proved to be their downfall as Europa Point took control and scored early. They then held on to the end to win 3-2. The match had its outside points also. At one stage the crowd cheered after a Monarch flight landed safely after five overshoots. As the match became more intense a cat also went in to have some fun, running across the field after found hidden in a cupboard where the trophy table had been placed.